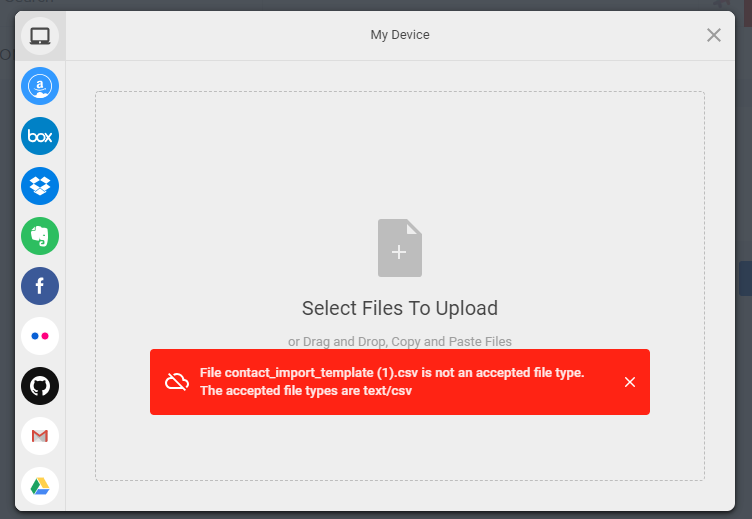 Error message "File contact_import_template.csv is not an acceptable file type. The accepted file types are text/CSV"
Windows Operating System - This feature doesn't work with Windows Operating System. Reach our support executive at [email protected] for assistance. Rearrangement of columns - Our system follow a specific format for uploading contacts in bulk as shown here https://cdn.filestackcontent.com/91HRt4efRZS1FIjexFZ9. You'll face an error if you rearrange any columns. Deletion of columns - The system throws an error if you delete any columns in the downloaded CSV file.